I do the same and have discovered a lot of lesser-known spots to visit. This looks like a lovely place to spend time. We happened to go on a sunny Sunday afternoon, which meant many other people were strolling there too. Several were fishing. I’ve found other good places by looking at a map. The surprise was to find one this close to home after so many years of taking pictures in Austin. That rippled glass effect in the last shot is great. Kind of neat to discover a new place, only nine miles from home. Yes, the discovery of a new place so close to home came as a welcome surprise. I started out looking at the map to remind myself of good places I already knew so I could pick one I hadn’t recently visited. It is amazing how much there is out there. I grew up in the Santa Clara Valley, with Mount Hamilton to the east and Mount Umunhum to the south. However, because of the distance, I have been to the top of Mount Hamilton only a few times. Mount Umunhum was used for military purposes, and then quarantined once abandoned, so was only recently opened to the public. I went there for the first time last year. What I’ve always liked about California is the huge number of scenic places. It’s hard to beat that combination of ocean, mountains, and desert. That is why the entertainment industry got established here. There are so many choices for scenery within a relatively short distance. When I see a Hollywood movie that supposedly takes place in such and such a place, I often wonder what part of California stood in for the exotic locale. I can often recognize familiar places that are supposed to be someplace else, or notice a certain species that does not grow where it is supposed to be. One of my favorite parks to write in while in Beverly Hills (in the Los Angeles Region) is on a variety of planets on Star Trek, and also near the Ponderosa on Bonanza, and also where Opie and Andy Taylor were skipping stones on the Andy Griffith Show. The original Blob landed there, and the original Creature from the Black Lagoon came out of the lagoon there. There is actually a long list of movies and televisions shows that used Franklin Canyon Park. That’s just the sort of thing I had in mind, except that you know the real place well and therefore recognize it. The closest I’ve come to that was a couple of days ago while watching a movie with a scene supposedly in Colorado; I thought I recognized it as Yosemite. This looks like a nice spot. The ripply refections are ripping. Nice, but not ripping enough to put in Ripley’s Believe It Or Not. A treasure within Austin. Good to see the redbud in bloom. I was looking forward to redbuds too. I hope our two nights that dipped slightly below freezing didn’t hurt the blossoms that were beginning to come out. Redbuds are in bloom right now. The blooms don’t seem to last more than a couple of weeks before they fall off, soon making way for heart-shaped leaves. 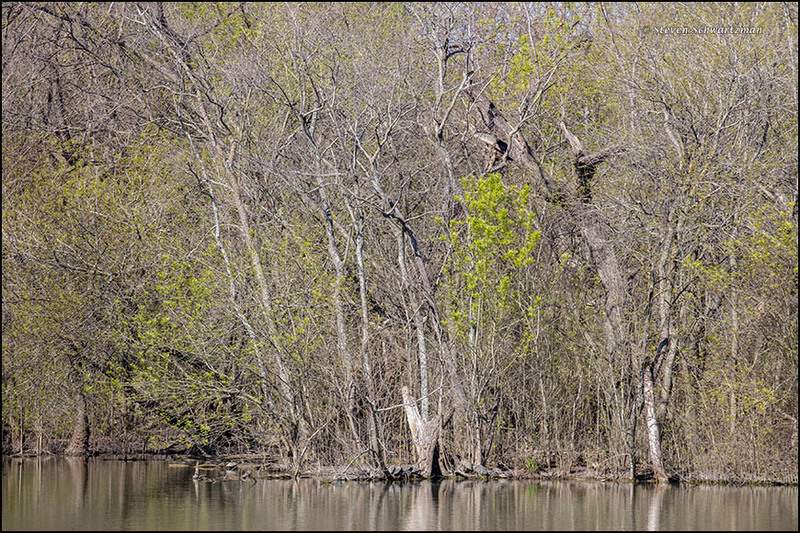 Steve, your redbud pic spurred me to create my composite of a coupla pix I took day before yesterday (very cold). How did our two nights of freezing temperatures affect the blossoms on the tree in your photo? I don’t think the temps hurt the redbud. Today I tried replicating the position I had when I caught the heart shape March 4. Wasn’t able to. Sky wasn’t as cooperative for pic-taking this morning and afternoon. However, I put a coupla pix on box com repository–one has ok color and focus, and the other is a composite that shows a bee at a blossom. It sure looks like the blossoms survived the freeze intact. That’s good to hear. And yes, today’s persistent breeze made picture-taking more difficult. The wind was blowing and made us feel a bit chilly, but that gave me the idea to photograph the ripply surface of the water. Those water photos are pretty amazing! 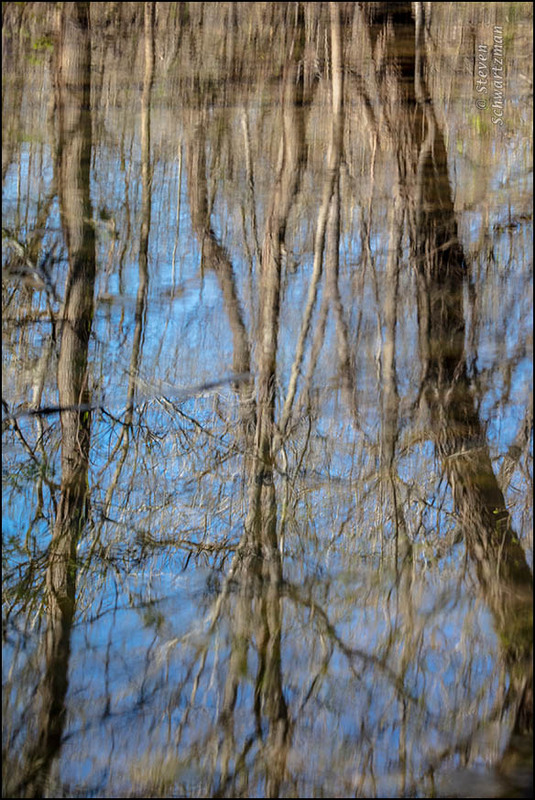 I’ve long been fond of reflections and textures, so those two pictures were right up my alley. I’m glad it gave you something to reflect on. I have the feeling that this was not your last visit there, Steve! So far it’s my only visit, but you’re right that it probably won’t be my last. One new place that will remain offsets to a small degree the many I’ve lost to development in the last decade. It sure is. In recent years I’ve counted more than two dozen properties where I once took nature photographs that have been built on. Each year brings several more. I’ll always remember how those places looked when I walked the land and took pictures in each one. When will we learn that we need oxygen and wilderness to survive? When it’s too late??? We remember Thoreau two centuries ago: In wildness is the preservation of the world. 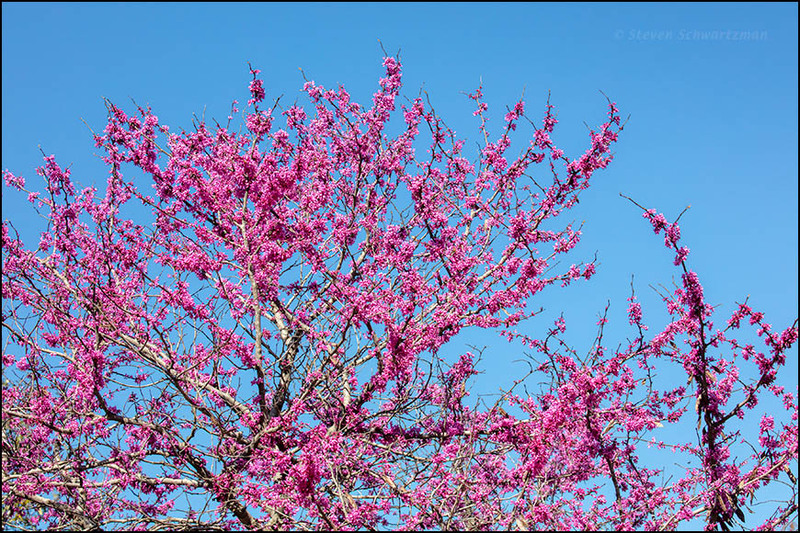 It’s interesting that on that same day as your walk, the redbuds I’ve photographed around Kerrville and the Willow City Loop were barely showing buds, while a few in Fredericksburg were blooming. I read on one of the wildflower reporting sites that Austin and the surrounding areas are a bit ahead of more rural areas because of the heat island effect. I only recently learned that even traffic can create that effect. On our radar this morning, Highway 6 and FM 517 are as obvious as can be. I suspect that helps to explain some of the early blooming of wildflowers along roadways. The third photo’s especially fascinating. 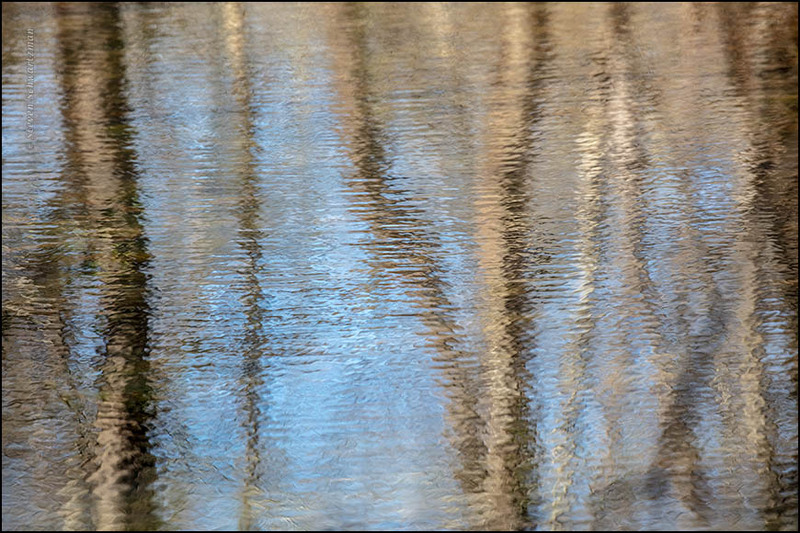 The horizontal lines appear to be an overlay, rather than ripples on the surface of the water, especially in the upper half of the image. I suppose they’re a result of the current, and perhaps even different densities of mud or sand being carried along, but it’s a fascinating effect, and one I don’t remember seeing before. Those horizontal lines at the top of the third picture had caught my attention too. I double-checked to make sure they weren’t power lines, which have occasionally intruded on a picture without my realizing it at the time, and which for me would spoil the image. The best I can tell, those darker lines were shadows cast from the side by tall trees. You’d think with all the pictures I’ve taken I’d have seen something like that before, but I’m with you in finding the effect new. As for traffic creating a heat island effect, I’ve noticed that the outside-temperature reading on our car’s thermometer sometime is a few degrees higher on a busy highway like US 183 than after we turn off and drive into our adjacent neighborhood. I think you’re right about the extra warmth (and carbon dioxide and monoxide) encouraging early wildflowers. It looks like a fun place to shoot! My favorite is the last. I like doing isolated reflections too. Imagine it as a large print! It proved a good place for nature pictures in spite of the fact that dozens of people were walking the path around the lake. The first picture shows a part of the shore where the path doesn’t go, and the other pictures all look up or down, so no people appear. The concept of finding a new area via map search, and then exploring it – gave my heart a big smile. What a lovely way to spend creative time that is also a balm to the soul! Then I reflected – that’s exactly how I found Poza Honda – by exploring the province via Google Maps and trying to dodge deforestation. Only the text loads when I refresh the ‘inbox’ to read off line, so now the post is on the screen and I’ll enjoy the images tonight at home. The rainy season is intense, so no time to loiter in the cyber! Good for you for finding Poza Honda that way. I’ve loved maps since I was a kid. In fact I used to collect them. One advantage of online maps is that we can zoom in a lot to see small details, like this pond that might not show up on a conventional map of greater Austin. When I searched on Google for “loiter in the cyber” there were no hits, so you’ve coined a euphonious phrase.